The principle idea in multibody dynamics is to model multiple bodies that are interacting with each other. Bodies are modelled as geometrical entities with inertia. Bodies can be rigid or deformable. In addition, actuators, hydraulic circuits, friction model and external forces are modeled. As a result of dynamic modeling and simulation, reaction forces and moments together with velocities and accelerations are obtained. Modeling and simulation can also be seen as a learning process and that produces understanding about the dynamical behaviour of the system and shortens the development time by reducing the number of physical prototypes. Multibody dynamic approach can be used to solve loading history of a complicated system or optimize dynamical behaviour of the system. Also, the multibody approach can be used to simulate cases that are difficult or impossible to test in real life. Below is some examples of cases where multibody simulation can be used. Stress distribution of the shrink fit. 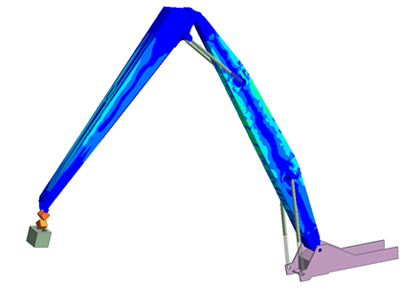 Multibody dynamic analysis suits especially well to simulation of large structural systems. A typical machine system is boom lifter (figure below). In this case the booms are modelled as flexible bodies and lifter frame and cylinder are modelled as rigid bodies. Bodies are connected with pinned joints. In addition to the mechanism, the hydraulic system is modelled, too. In this way, the model takes the interaction of hydraulics and mechanisms into account, in addition to the flexibility coming from the hydraulic system. Drivetrains can be modelled roughly or detailed in MBD. The modeling accuracy should be chosen according to phenomena that is studied. It is often unnecesary to model non-essential parts in detail. For example, the gear in its simplest form just changes the input moment and rotational speed. However, it is also possible and sometimes also necesary to model single gears with flexible teeth with contacts between them. 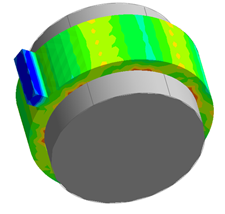 By using detailed modeling, it is possible to study the torsional vibration behaviour caused by tooth contact, braking or clutch forces, for example. Below is an example of two flexible gear wheels, one of which is connected to the massive disk by a flexible shaft. A contact with gap is modelled between tooth pairs. In the beginning the disk restricts the rotational acceleration and this together with gapped contact causes oscillating behaviour during start-up. In the figure below, the stress distribution of the gears is shown. 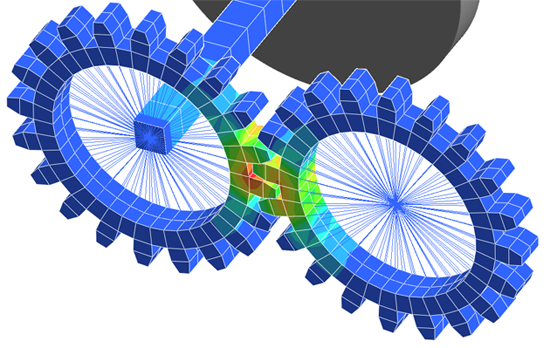 Stress distribution in gearwheels in contact. Another example is a shrink-fit joint. The roots of multibody dynamics are in rigid body dynamic analysis. Features familiar from FE world can be used when modelling flexible bodies in MBD. In this example, the shrink-fit is tightened first and the actual dynamic simulation is run after this. The stress distribution of the flexible hub after tightening on the shaft is shown in the figure in side bar. Multibody model is a virtul prototype that can be tested early during product development when no physical prototypes exist. Seeing the dynamic behaviour of the system helps developers to understand complicated causations of the behaviour. Understanding of why the machine behaves as it does is thus improved. Using traditional methods, the detrimental resonances for system function may be left unnoticed. This may prohibit the use of the machinery or in worst case break it. Forces and moments in the dynamically complicated structural system are obtained using MBD. These forces can be used in subsequent FE analyses. Typical results of multibody dynamic simulation are stresses, accelerations and velocities in the bodies and forces in actuators and joints. We use RecurDyn software for our MBD analysis together with different pre- and post-processing software (SpaceClaim, Ansys Workbench etc. ).